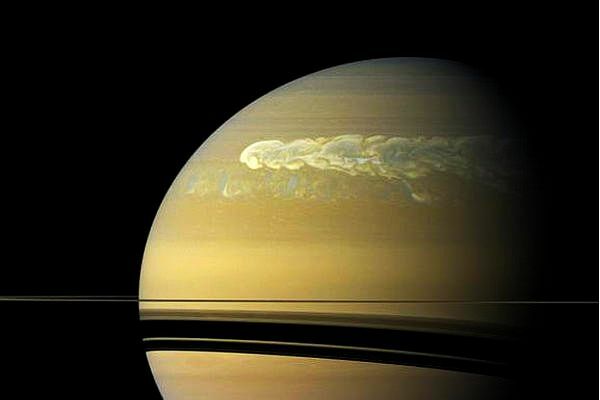 "Monster storm reveals water on Saturn"
A thunderstorm bigger than our planet churned Saturn's atmosphere like an egg beater, reaching deep into Saturn's gassy interior and flinging water up to the ammonia-gas cloudtops. It was a dark and stormy night. Actually, it was a dark and stormy year. From December 2010 through August 2011, a superstorm raged across Saturn. The storm moved west, leaving behind a wake so enormous that ultimately the head collided with its own tail, encircling the giant gas planet with a belt of turbulence over 9,000 miles wide and 190,000 miles long. And in studying it, scientists found water. This massive thunderstorm – the head alone was bigger than planet Earth – churned Saturn's atmosphere like an egg beater, reaching deep down into Saturn's gassy interior, finding water vapor, and flinging it up with "hundreds of miles per hour of upward motion, if you can imagine that," says Larry Sromovsky, a space scientist at the University of Wisconsin-Madison and author of a new paper analyzing the monster storm. Scientists have suspected for years that water vapor must be hiding in Saturn's lower atmosphere, but finding proof was tricky. "As far as water in measurable quantities, at the level of the visible cloud tops – this is the first indication," says Dr. Sromovsky. The first scientists who studied the storm noted its size and power, but missed the scent of water. They concluded that the clouds were made of ammonia ice. That's a key ingredient, Sromovsky agrees, but it's not the whole story. "The fingerprint for ammonia ice has some pretty sharp features, and those features were muted by something else," he says. Like a chef trying to reproduce someone else's secret sauce, he experimented with various substances, looking for the right chemical combination to match the "fingerprint" his team had detected in the superstorm. An obvious possibility was the mysterious gas that makes up Saturn's outermost layer. Another was ammonium hydrosulfide, a known ingredient of Saturn's skies. The data didn't rule out either one, but neither could have "muted" ammonia's signature, he says. "Water completed the picture, so now we could get an accurate fit to the spectrum," says Sromovsky. But something's still missing. "There's ammonia ice, and there's water ice, but we still don't know what this third material is, exactly. It could be ammonium hydrogen sulfide or it could be the material that's everywhere else near the cloudtops of Saturn, or a mix of the two." Scientists working to model the ice droplets have suggested that water vapor started low in Saturn's atmosphere, and then as the megastorm pulled it higher and higher into the colder skies, it condensed "first water droplets, then frozen water – water ice – and then that gets coated with other materials as it gets colder and colder.... It's quite likely what we have are multi-composition particles with cores of water ice and coatings of ammonium sulfide and ammonia ice." Saturn gets frequent thunderstorms, says Ulyana Dyudina, a research scientist on Cassini's camera team, but storms like this one – which is actually not just one storm, she says, but "a huge system of multiple-centered storms" – happen roughly once per 30-year orbit. This is the sixth superstorm humans have observed on Saturn. The last one hit in 1990, so this one came about a decade early. "It's not exactly periodic," says Dr. Dyudina. And it isn't quite done yet, either. The massive storm system spun off a vortex that swirled in the opposite direction. When the storm had lapped the planet and caught up to its vortex, in July 2011, the vortex sapped the energy from the storm head. The lightning and thunder, which had been crashing brilliantly in the storm head once a second for the past half-year, slowed and ultimately stopped, but that vortex kept on spinning. "It's still visible, even now," says Dyudina. And it's still huge. "The vortex that was left over is of comparable size to the Great Red Spot," she says, referring to the centuries-old storm on Saturn's neighbor, Jupiter. "It's huge."